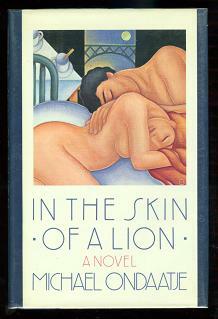 I’m re-reading and pondering Michael Ondaatje’s book, In The Skin of A Lion. I love this book. For me, this is a book to read again and again, to study and learn from. This novel is an open apprenticeship. Any good novel might be like that: think about which novel yours might be. This one speaks to me. This entry was posted in Uncategorized and tagged fiction, In The Skin of a Lion, Interdisciplinary Aesthetics, Michael Ondaatje, poetry, reading, reading like a writer, words, writing. Bookmark the permalink. LOVE that book. I grew up in Toronto and so feel quite homesick when I read it. Beautiful language. I’d suggest you read his “Divisadero” as well. It’s lovely…feels like a Terrence Mallick film. What a great recommendation. I love the Terrence Malick films I’ve seen. Thanks for stopping by! it’s been a few years since i’ve read “lion.” i need to prowl back thru it a bit, i think. funny, i was thinking randomly today of rereading “the english patient,” which has also been a few years. somebody said something the other day that made me think of the book. and btw, any malick film is worth it. Ron, thanks for stopping by. I agree about Malick. I need to re-read The English Patient, too, because for me, it stands in the shadow of Lion. And I want to give it another chance! After all, Ondaatje’s writing makes me swoon, so what am I waiting for? Funny coincidence. Maybe for a bit of The Cinnamon Peeler this evening. I love “Elimination Dance (An Intermission)” It’s been a while since I read his poetry. Phil, thanks for finding the post! I’m glad to hear of others, too–I was just yesterday thinking, hmm…should I use this book again for this fall’s class? Your comment must be a sign that yes I should. And yes, so many of those images haunt me, too.